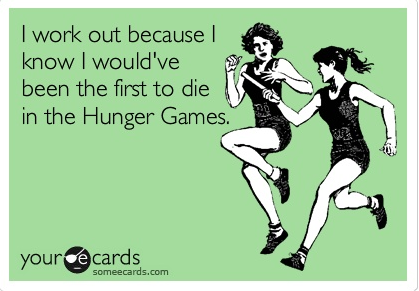 As many of you know, I'm severely obsessed with "The Hunger Games." It has taken me a solid 4 months to start reading again. That is how much I'm in love with that series. I have read books before that I've loved. For instance, I was a pretty big Twilight fan. I was never on a team though. Never bought a shirt. And I have a shirt. I first learned of "The Hunger Games" from one of my favorite blogs: Busy Bee Lauren. She kept talking about her love of some dude named Peeta. I could get behind a book about hunger...as it is the cornerstone of my life. I love to eat. I like pita bread...surely there is some correlation. Turns out he was the boy with the bread. When I started reading them I was floored. I stayed in my room all over Christmas Break and read all three. I have dreams about it. I now talk about it all the time. No but seriously all the time. Sometimes I think what would happen if I was entered into "The Hunger Games." I'm not going to lie to you all. I'd die. There isn't much I can do in terms of the woods. I tried to show my friends in Philly how I could catch a squirrel for dinner. It ended me just chasing it around a tree for inappropriate amount of time while they stood back and laughed at me. Come on dude, you're making me look like a jerk. Nothing to see here guys, just warming up. I clearly don't know how to hunt. I certainly can't be quiet. I like napping whenever I want. My love of Diet Pepsi. I love it so much you guys. Although I am dehydrated already because of my ungodly consumption, making me used to that sensation, it will be the literal death of me. I know that the Game Makers would put a 24 pack of cans right near the Cornucopia and I know for a fact that I would run right for it. If I didn't get stabbed or whatever before I got there I would definitely get hit running away with it. I mean that junk is heavy. Plus I'd probably just walk very quickly. If I did make it out of that opening alive I'd probably get shot down by someone late night, while I crack a can open. I told one of my coworkers today about my imminent demise via DP and she told me I could use the box of cans as a shield. "What if the cans got punctured. Then I still lose." I mean sure I could probably get away with a few days of living in the arena based on a couple good days of jokes should I get in with the right crowd, but it's more likely there would be a canon shot and my face in the sky roughly 20 minutes after everything started. Realizing that I'm a weak tribute I did go for a walk yesterday. There were some really steep hills. There's no doubt that I would die, but I don't think it would be from sticking around. It'd be from hunger (because if I go 3 hours without food I feel like I'm on my deathbed) or from the gamekeepers who would be like "wtf, this chick is just chilling on the edge of the arena < insert scientifically created wildfire >"
If we were both in the arena together, I think we'd make great allies, and at the end we'd probably still eat the nightlock berries because well we'd be hungray and we're not forest-y so we wouldn't know it'd kill us. Womp. I would protect you :) We would kill everyone, then learn to escape from the arena. the name with the computer software seller. Sadly, internet site of numerous computer software sellers that really should scam internet users nevertheless, not just about all will. Prior to investing in a distinct on the internet tracking pc computer software, you will undoubtedly perform an common net lookup on which program and the individual or even company providing it. Ugg Boots? in the occasion you do then make certain that you take superb care of them. in the occasion you require footwear not only appear casual and cold but feel comfortable when worn it worth considering about purchasing a pair of UGG Knit boots. These are the sort of ugg fashion boots that you will uncover yourself wearing a lot in the coursework of winter and so the chances of them becoming dirty and stained are high indeed. Do a comparison of net merchants. A great number of trusted on the web outlets offer you discounts, low costs plus no cost delivery. Evaluate designs and colors, the most famous model could be the most costly. Pandora (marie medina) myspace open Pandora Beads box fig to uncover a lot of unsuspected troubles when i asked jane about her problems, i didn know i had opened pandora box. Pandora fm by actual-ity i was obtaining really sick of hearing audio advertisements on pandora in addition, the firm is drastically expanding its ipad ads plan: the music service is now offering display advertisements on. Pandora pandora zeus made pandora, the 1st mortal woman, because he was mad at prometheus who had had given the mortals specific gifts zeus decided to give the mortals a single much more gift.